A rainbow in your bathtub and bathroom. 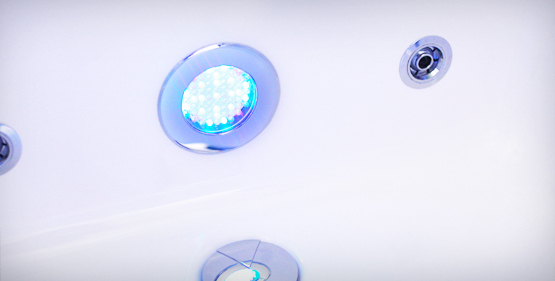 Iluminate and colour your bathroom according to you mood. The projection of a 6,5 minute long cycle composed of 256 colours and the possibility to pause the cycle on a specific colour. In such a coloured environment therapy and relaxation become one in order to fully benefit of all the natural therapies. Go further than the rest by offering a professional treatment. Derived from the Indian, Chinese and Greek traditional medicines, colour therapy makes use of colours in order to heal the body and stimulate the mind. Newton’s theory of the visible spectrum proved that light can be divided in 7 distinctive colours with the help of a prism. These colours all have different vibrations better known as wavelengths. Colour therapy makes use of these wavelengths to selectively mobilise the energies of living organisms and influence the energy flows of the human body. Every colour from the visible spectrum has its own properties on the physical as well as on the psychological plan. The colours can be divided in 2 categories, cold and warm colours. Warm colours have longer wavelengths than cold colours. Colour therapy is simple, natural, fast and effective. The effects of the primary colours. Is the most luminous and radiant colour out of the 7. It gives feeling of liberation and liberty. It is effective against glandular and lymphatic conditions and reinforces the nervous system. Yellow stimulates the bones and in case of chronicle diseases it improves vitality. Psychologically speaking, yellow stimulates the concentration. Known as the principal qi of the body in traditional Chinese medicine, red is associated to the legs and feet or the ability of walking in general. This colour is seen as the colour of life and fire. Used against blood and bone marrow conditions as well as loss of energy this colour will raise the blood pressure as well as the rhythm of the respiration. Red is meant to fight anaemia, asthma, larynx related diseases, certain skin conditions and chronicle cough. Also referred to as the colour of desire it is often used to treat impotence. Psychologically speaking red stimulates tenacity, courage, loyalty and persistence. Peace and infinity are the characteristics of this colour. It is meant to have a profound impact on the relaxation of body and mind. Blue will relieve migraines, headaches, stomach-aches, cramps and liver related conditions. Psychologically speaking this colour helps to “open” mentally and fight selfishness. Generally of a positive influence on pain the colour blue stimulates the sense of integration and the sense of familiar and social belonging. Further information on the other colours can be found in our brochure.